This entry was posted in Uncategorized and tagged california accents, Canadian Accents, vowel shifts. Bookmark the permalink. It’s interesting that you mention a similarity between Canadian and Californian as I, a native Californian, have heard myself say something and think that it sounded Canadian. Or at least what I perceive is Canadian. I’m in Orange County/Long Beach, which seems to have it’s own accent when compared with other parts of CA, at least I think I’m hearing a difference! 🙂 I’ve no formal training, just a fascination!! Interesting stuff. I’m not a linguist though and don’t understand all of the terminology. Is it possible to include examples to illustrate exactly what you mean – especially in the vowel sounds in food bit? the y used in the transcription of “too” is the same as the u in french “tu” or the german “ü” in “über”. It’s pronounced farther front in the mouth than the “traditional” u/oo found in, say, a philadelphia accent or a minnesotan. If you’re interested in this stuff, you should learn the international phonetic alphabet. There’s a great wikipedia page for it. It’s a little daunting at first but it’s not that hard and it’s really worth it. Yeah, I’m glad you pointed this out Ben- I’ve always noticed this too. A lot of people I know allege that canadians sound just like “Fargo” accents, and I would concur that it’s because of the “Northern” similarity between the backed vowel sound in “goat” and “face”. This is also why I used to think when I first went to school in Buffalo that Buffalonians sounded “Canadian”, considering the NCVS in buffalo is sort of related to Wisconsin and Minnesota accents. But after getting more into dialects I obviously see despite a couple similarities how there’s quite a difference between say people in Niagara Falls, NY, and Niagara Falls, Ont. Also, I find it funny Monyhan’s canadian Rob Ford accent almost sounds like a Chris Farley impression at times. The way he emphasizes “Apah-luh-gize” is all backwards- it would sound more “Apaw-luh-gize” from a real torontonian! Rob Ford does kind of remind me of Chris Farley. Haha True, his mannerisms definitely do, someone even made a compilation video of the two of them. But Bobby seemed to be doing something close to Farley’s Wisconsin accent, which is distinct (if a tad similar at points) IMO from a toronto accent. A guy I knew from Connecticut used to, when he was mimicking a Canadian accent, talk with a Northern Cities shift type of accent instead, and say things like “hackey” for “hockey.” Maybe people just assume that the far Northern accents they’re familiar with are the same as Canadian ones. In his case, I think he had been to Buffalo and had some experience with Buffalonians, and he figured the weird vowels he heard there were Canadian. I personally can’t remember ever hearing a single Anglophone North American say “yah” non-facetiously, if by “yah” you mean [jɑː]. What I have heard, I think, is something more like [jæː ~ jaː] as opposed to [jɛə]. The latter is the pronunciation Dictionary.com gives for the word. Having had a few Canadian friends over the years, none of them sounded anything remotely close to people from the Great Lakes or Minnesota/Wisconsin/North Dakota despite the geographical proximity. While certain Canadian features are noticeable when you’re actively looking for them, I find most Anglophone Canadians to sound pretty similar to Midland, Western, and General American. Yes, great reference, like “dee” for “day” and “aboat” for “about.” He’s quite sincere, isn’t he! Yes lol. His “O” sounds cracked me up too, you just CAN’T get any more Canadian sounding than this even if you tried. The fact that he’s trying to be a Rapper just makes it all that more amusing. Now that kid’s /u/ does sound closer to cardinal 8 ([u]) than my own in the word movies at 1:53 (I’m American if anyone who reads this is curious). But that’s after a non-coronal consonant. So maybe the SNL dudes heard a post-non-coronal allophone like that one and assumed that Canadians used it in all phonetic environments. As a Canadian I was left shaking my head at that sketch in disappointment. Not because it offended me or anything lol, but because they just didn’t “get it right”. I hope not. I want Canadians to sound Canadian. No this isn’t really true. Don’t worry, I’m from Ontario and the Canadian accent is not going anywhere at all. Neither is there that *much* of a difference between urban and rural dialect in a drastic sense. The Californian Vowel Shift is not as prevalent in California as The Canadian Vowel Shift is in Canada. While the Canadian VS may sound neutral in Canada (outside of Atlantic Canada and maybe Toronto), the Californian VS screams ”Valley Girls”. As Valley Girls grow older, they get rid of the accent and shift to the ”Neutral Californian”, while Canadian women continue using their shifted vowels even in older age: y[æ]llow, d[ɔ]llar, dawn/Don [dɔ:n], mom [mɔ:m] cast [ka:st]. Many young Californian girls/women (outside the Valley) have unrounded [ɑ] even before L (all, caller/collar, pol/Paul) and NG (long song, Hong Kong), which may be interpreted as an subconscious reaction against the rounding and shifting of ɑ (to ɒ, and eventually ɔ). In Canada only old men (across the country), Toronto males and Atlantic Canadians (especially those from Newfoundland), don’t round [ɑ] in ”all, caller/collar, pol/Paul, long song, Hong Kong, doll, dollar, college” etc. Very few Americans pronounce DOLLAR with ɒ/ɔ (except for Valley Girls and people speaking Pittsburghese and Bostonese), while it is the norm in Canadian English (Oxford Canadian Dictionary recommended the rounded pronunciation for the cot/caught vowel, which is normal in BC and Alberta, but non-existent in Newfoundland (where the merged vowel is [ä] or [ɑ]). Phonologically, standard Canadian English and standard Californian English are close, but phonetically they’re pretty different. you can clearly hear the differences between her real-life accent, and her acting accent. that’s why she has to ”adjust”. That seems to be true in my experience. I feel like I have to look much harder to find Californians with the CalVS than I do to find Canadians with the CanVS. 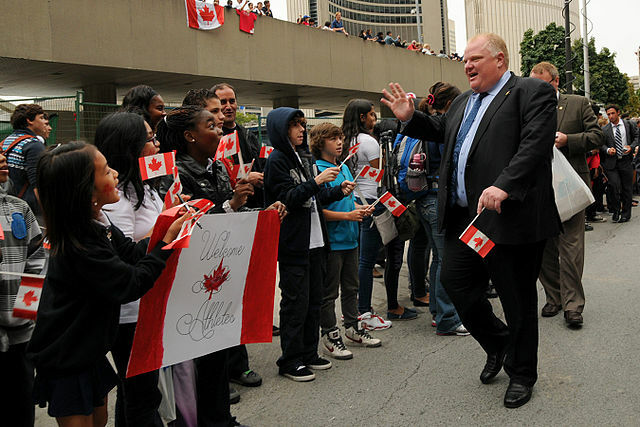 Hell, even middle-aged Canadian men like Rob Ford have the CanVS. I think I’ve heard it with some people older than him, at least with /æ/. For some reason I doubt someone like him would have the CalVS if he were from California. I’m going to sound silly but is CVS the same as Canadian Raising? And what did you hear in Rob Fords speech that demonstrated CVS. No the CVS is the Canadian Vowel Shift. However, I think it could also stand for the California Vowel Shift, which is why I abbreviated it CanVS in my last comment. The Canadian Vowel shift is a term that describes how some vowels in Canadian English tend to be pronounced a bit differently from how most Americans pronounce them. As an American from the Midwest, the 2 vowels I notice most in this shift are the vowels of “tap” and “top”. Here is a YouTube video of Rob Ford making a speech. The way he says “past” at 1:02 and “ask” at 1:40 into the video both sound shifted to me. The vowels in “not” and “comment” at 1:22 also both sound shifted to me. Don’t feel too bad if you can’t hear how those are any different from how a Midwestern American would say them, because their subtly different. The way the (soon to be famous?) Canadian rapper whose video you linked to above has a very noticeable (to me) shift in the word “laugh” near the beginning. It’s funny though, while I know a lot of canadian vowels are similar to californian/west coast- I would never suspect Ford was from California from listening to that interview. It sounds pretty different to me, he just has too much of a “northern-y” twang. Idk, maybe it’s just me. But then again when I listen to younger canadians, like Sum 41 say, they sound very similar to Californians. Their accent sounds more “neutral”, I guess. btw, what accent do you have william? I think of my accent as a pretty generic American accent. I’m from the Midwest, like I said. I’m from south of the NCVS area. My dad is from the Chicago area, though, so my accent may a bit Chicago-influenced. It’s not just you. I’m not from California or Canada and I agree with you. Maybe you know this already, but Canadian raising is a term for how Canadians pronounce words like “house”, “about”, “mouse”, etc. It also applies to words like “mice”, “nice”, “lice”, etc., but that part of it is less famous. Here is a webpage that explains Canadian raising with audio examples. If you go here and click on “North American English dialects”, a colorful map should appear on your screen. If you click on Canada on that map, a description box should appear with links linking you to other descriptions and audio samples. Well I’m Canadian and I hear CR everyday lol, no need to link examples. I know exactly what it sounds like (all too well). I was just a bit confused about the Canadian vowel shift. I perceived it to be the same as Raising with the “drawn out” vowel sounds but I guess I was off a bit. I know a word like “sorry” pronounced that Canadian way “Sorey” is CVS but I wasn’t aware about what other words were too. You know it’s a little depressing to find out that I have just about every “distinctly Canadian” linguistic feature in my speech . I liked it better before when I was oblivious to my own accent and the CR and thought I spoke “neutral”. Oh well lol. The way words like “sorry” are pronounced in Canada is actually a different phenomenon from the CVS. As a Canadian living overseas, the last paragraph sums up our experience pretty well, we’ve had people who have relatives in Ireland ask us what part of the North we were from (meaning Ireland), they were quite confused when we said we were from Canada. We’ve had a few Irish people even ask us how long we’ve been away from ‘home’. It is even funnier when we are out with our Irish friend and people ask us (the Canadians) what part of Ireland we’re from, yet don’t ask our Irish friend. Interesting. With the exception of some Newfoundlanders (and maaaybe some Cape Bretoners), I would never have thought a Canadian English accent would be mistaken for any type of Irish accent. NPR reporter Lise Doucet always made me wonder how an Irish reporter got a French name till I learned, to my utter surprise, that she’s from New Brunswick. Well that’s Eastern Canada, which is totally different from the rest of Canada accent wise. I’m a Canadian in Scotland, and have a very mixed accent (according to a linguistics professor) and a lot of people think I’m Irish. Depends where I fall on the Canada-Scotland continuum that day. I have really strong CR, am well into the vowel shift, and have also fallen into the strut-foot merger, and I think that combination confuses people. @William: Oh! I thought “Sorey” was a part of the CVS, my mistake. Apropos Lise Doucet, the BBC reporter who may now be on NPR, I would have to say her accent is unique to her. Not a single other New Brunswicker sounds like her. She occasionally moonlights on CBC as well, so I’m quite familiar with her voice. Having emigrated from southern England to Nova Scotia in 1959 at the age of 12, it took me about six months to fully grasp the main differences in pronunciation. Kids want to fit in at school. In those days, there were many Americans from all over the States who had summer homes in my area. We rented our home from a Hawaiian! All he wanted to do was tell us British we couldn’t pronounce “aloominum” correctly, so a bit of a dud, funwise. On and on he would rant. The actual scientific spelling is aluminium, apparently discarded in the US and Canada for pronunciation purposes eons ago for some reason. It was a hoot that first summer in Nova Scotia to listen to my mother and a woman from Denver agree on the state of a back road. My mother said the road was “impassable” and the Denver woman agreed it was “impossible”. I realized at once what was happening and got the two of them to talk about it. The pronunciations were virtually identical. Which soon led me to realize that many Americans pronounced the short o as in god as ah instead. Canadian and British pronunciations of this short o are much closer to one another than this drawn out American ah sound, (Newfs excepted) which eventually leads to my ears, at least to mispronunciations like Viet Nahm, Nissahn and pahsta. Dead giveaways as to country of origin and rather funny really. The Denver lady called her hubby Char-rulls, which was an eyeopener to me, because that is a one-syllable name in the UK. But I just loved the differences as little avenues to explore. Judging from this blog’s comments, people would prefer to call everyone else’s pronuncuation incorrect and argue the toss instead. What a waste of time – nothing’s going to change! I call some pronunciations incorrect to my way of thinking, but don’t dwell on it. In any case I returned to the UK in 1969 for graduate studies, and soon discovered expat iCanadians trying to sound like the English, but ending up sounding like Lise Doucet instead. Her accent is a put on so as to get a BBC job and really grates on my ears it’s so fake. Meanwhile, possessing neither an English nor Canajun acksent, the Londoners were convinced I was from Somerset in Western England. Great fun. The other thing I’ve noticed over the years is that it seems Americans are in general pretty poor imitating other English accents beyond other US accents. I have NEVER heard an American do a Canadian accent well at all. Only a few ever do a good British accent and many a movie has been ruined as a result, IMO. Even the draft dodgers who’ve been here in Nova Scotia for 40 years or more still sound like Yanks, and some get upset when you spot it right off the bat. What a hoot. Anyway, think of Robin Hood and the longbow. Take the bow sound, add an uh in front and a t afterwards, and that’s how Canadians, in general, pronounce about. Or aboat when in a hurry. There is a difference. Why everyone gets so hot and bothered about accents is beyond me. No doubt in the end we all may well have a Madras accent considering the numbers of people involved. At least call centre folks will finally be understood by the general populace! Let us celebrate diversity for the laughs we can have rather than sourpuss comments with folks claiming they pronounce things as they’re spelt (British spelling, you know). Everyone has an accent – they just don’t realize it. I wonder if there is a significant North East England influence in Canadian English. The way Cheryl Cole talks sounds somewhat like an extreme version of a Canadian accent to me. Like saying “reet” or “rate” for “right”, the uptalk and the elongated rounded o’s. What about raising of /ai/ and/or /au/ in certain environments? Then there’s the fronting and/or raising of the vowel in words like star and stark ([star], [stʌrk]). I don’t think people are picking up on just a single feature that the 2 accents have in common.